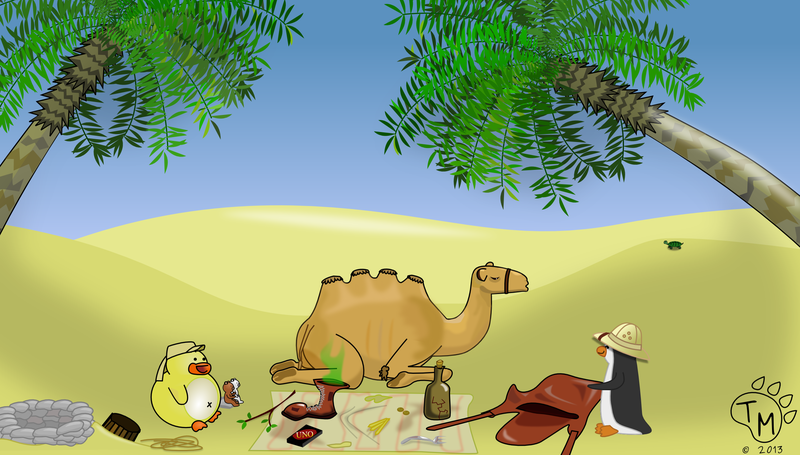 The desert was hot and everyone including Cornelius wanted to get to the destination on the map as quickly as possible. Ducky tried to encourage Cornelius to speed up by repeatedly smacking the camel’s hindquarters with a stick and yelling “Giddy Up!” This approach, however, did not have its intended effect because, after a couple of minutes, Cornelius found a shady spot and sat down refusing to go further. “Oh, I, uh, forgot to pack water, but I’m pretty sure I packed food,” said Ducky. “I was rushing. I just started grabbing stuff. Plus, you have to admit, UNO is a good family game,” Ducky said sheepishly. “We got an idea,” Ted and Blizzard said in unison. “It looks like there is a well behind Ducky and an old bucket with some rope,” explained Ted. “If Pembleton is able to fix this bottle, maybe we can use it to store water for the rest of our trip,” Blizzard added. After everyone had enough to drink and their bottle was filled, Pembleton made Ducky apologize to Cornelius. After some coxing, Cornelius forgave Ducky and they were on their way, again. If I didn’t know better, I would say Ducky is a silly goose! !